While we're on joint locking, let's have a look at the Malaysian art of Silat Kuntau Tekpi. Silat is renowned for its rich repertoire of sophisticated locks and throws, and this clip shows how how some of these are executed within Silat Kuntau Tekpi. The name of this art is unique because Kuntau is the Malay word for Kungfu, and normally Silat and Kungfu are not mixed together. In this case, the founder of the art, used the word Kuntau to mean hard techniques. Hard as in going in hard when soft techniques do not work. Tekpi is the Malay word for a three prong truncheon, similar to the Japanese Sai, the primary weapon of this style of Silat. Speaking of Choy Li Fut (Choy Lee Fut), here's the great-great grandson of its founder Chan Heung, Master Chan Yong Fa, (Cantonese: Chan Wing Fat) demonstrating rarely seen Choy Li Fut Qinna (Chin Na or joint locking). Unlike more well known locking arts, the Choy Li Fut's locks shown in this video require very little setup, and uses the whole body in application. The narrative is in Mandarin but non-speakers should be able to follow Master Chan's animated presentation without difficulty. After a recent slew of Wing Chun movies, here at last is a movie on Choy Li Fut, the other famous Cantonese martial art. Choy Li Fut (romanized variously as Choy Lee Fut, Choy Lay Fut, Cai Li Fo) is named after the three martial arts which its founder, Chan Heung, learnt: Choy Gar, Li Gar and Fut Gar (Gar is Cantonese for Family). This movie stars Sammo Hung (again! ), his son Sammy Hung, Yuen Wah, Lau Kar Wing and Ken Kosugi. Ever wanted to use your martial arts to render assistance to a person in trouble? What would you do in the situation shown in this clip? In the same vein as our ground breaking video on the Origins of Wing Chun Chi Sao (see link below), we have here an astonishing video of a Wing Chun practitioner taking on a Real Boxer. The Wing Chun guy won but only because the Boxer gave way. 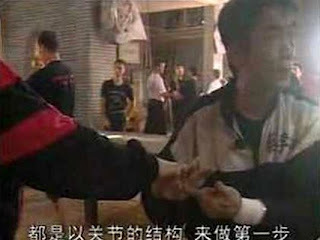 In an all out fight, the Boxer would have made mince meat of the Wing Chun guy's fingers, face and throat in quicktime. Not a comment on Wing Chun, most other martial arts will have real trouble with this Boxer. To wrap up our series on Shi Dejian, here is a clarification of a number of terms associated with him: Shaolin, Chanwuyi, Xinyiba and Wugulun. Shaolin: The Northern Shaolin temple in China. Shi Dejian is an ordained monk of this temple. Chanwuyi: Chan=Zen, Wu=Martial, Yi=Healing. An integrated branch of the Shaolin arts. Xinyiba: The Shaolin martial art Shi Dejian mastered. Other Shaolin martial arts include Lohan Fist, Hong Quan and Canon Fist. Xinyiba is a component of Chanwuyi. 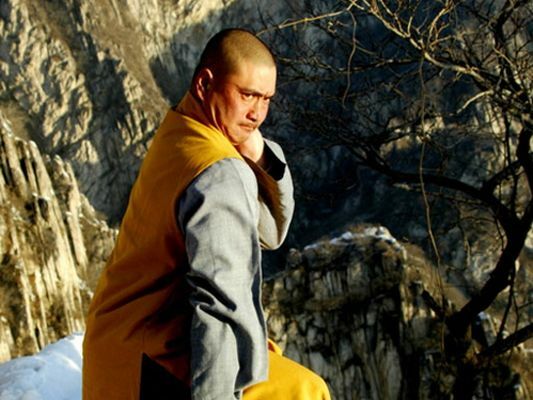 Wugulun: The lay master who studied Xinyiba while apprenticed at the Shaolin temple. Master Wugulun passed down Xinyiba when the art itself was lost at the temple due to war and social upheavals. There is no video for this article. Update: The photo shows Master Shi Dejian on the left in a sparring pose with his peer Master Wu Nanfang. A authoritative and in-depth explanation of the above-mentioned terms can be found in Master Wu Nanfang's excellent website. Scoop: Shaolin monk Shi Dejian sparring with a Chinese state boxing champion. Though this video is a compilation of Shi Dejian related clips, the spar itself starts at 1:15 and last a few seconds only but, it one of the most instructive clips of how a Shaolin exponent might handle a boxer where others have just vaguely eluded to this. Of interest is how Shi Dejian makes use of what might look like contemporary fighting techniques: the bob and weave, and ending the fight with a classic MMA takedown (the clip ends with a suggestion of this). Perhaps viewers might think he IS using modern MMA techniques. When your opponent punches at you, don't use your hand or elbow to block because the block will delay your counterattack. If the smallest moment is lost, it will give your opponent time to recover and attack you again. You should move and duck to avoid the punch as you simultaneously counterattack. Zhe Rou Fen Qiang (Don't duck too early). Duck at the split second when your opponent's fist is almost touching your flesh. In this way, your opponent's punch is fully delivered. He thinks he's got you and has no opportunity to redirect his energy. Stick close to your opponent's body, eliminating the space between you and your opponent which can jam your opponent's strike. When your opponent moves backward to make room to attack, you seize the opportunity and attack first. In the short sparring section, Shi Dejian amply shows how all three strategies are used against a Western Boxer.